When a well’s production starts to fall due to decreased hole pressure, there’s a few techniques you can use to bring its output back to former levels. Mechanical lift can be one method (which we go into here: A Pumper’s Basic Guide to Mechanical Lifts in Oil & Gas Production, here: A Basic Guide to Operating and Servicing Pumping Units in Oil & Gas Production, and here: A Basic Guide to a Standard Wellhead Design and the Polished Rod in Oil & Gas Production) but once production begins to fall further, a lift may no longer be effective. It is possible to extend the usefulness of a mechanical lift and change the lift system in order to make up for the fall in production. You could try adjusting the lift system by increasing the stroke rate, or install a pump with a lighter counterweights and a longer stroke. As you begin to pump more water and less crude oil, another method to try is a waterflood, which uses water pumped in at a reservoir to push oil to wells being pumped. Eventually, however, production will fall to the point that you’re pumping constantly through the day due to the increase of water production. At that point, you’re going to have to put in a system that can make up for that fall in production. An electrical pump is a good option, particularly in waterflood operations with a high volume. Why Should You Use An Electrical Submersible Pump Lift? An electrical pump lift is able to pump large volumes at medium and shallow depths, with casing size not having much of an impact on the production volumes. When waterflood increases, it’s not uncommon to pump a few thousand barrels a day. This system can easily use automation to have the system pump only for a certain amount of time each day, or to have it pump continuously. Electric submersible pumps have a relatively low get-started investment for shallower wells. With that said, there are some potential problems when using an electrical submersible lift. Build up of scale or gyp sometimes reduce the fluid pumped by submersible pumps. High electrical costs can be another downside, particularly if you’re in a remote area. A submersible pump isn’t as flexible in some situations, and if there’s a problem the whole system has to be pulled. There are two primary parts of a submersible pump: the pump itself and the electric motor that powers it. Generally, the pump is above the motor. An electrical cord is attached to the pump tubing, usually protected somehow, and is used to provide power to the motor. The whole thing is dropped into the well with both the motor and pump submerged. The pump works by rotating a series of disks or cups, driven by the motor. To pump from deeper wells you’ll need to add more cups, which allow the pump to push liquid further up to the surface. 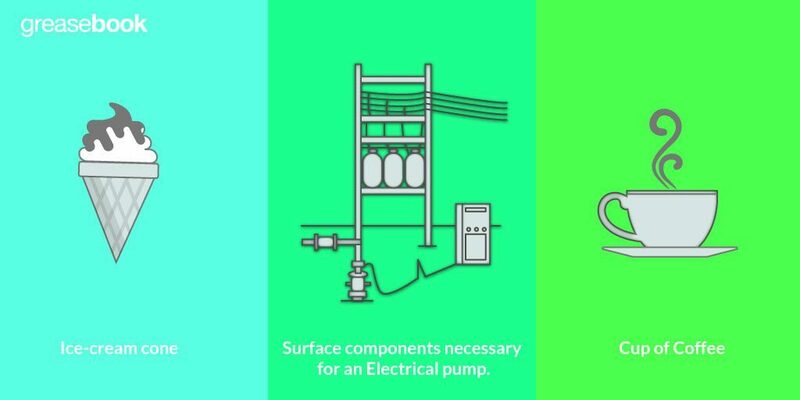 There’s a few things to keep in mind about the surface needs of a submersible pump, you may have to be flexible and innovative. A common suggestion is to run a joint of pipe from the well to the control panel, which will provide a conduit through which to run the power cable. The pipe will protect the cable from being damaged by equipment or weather. You may also want to leave the power cable a little long, and hang it by the control panel. You’ll be able to lower the pump without having to splice additional cable into the electrical cord. Figure 1. A pump and motor. Control Box: As you might have guessed, this controls the pump motor. It can be set to allow the well to operate continuously, for set periods, or to be shut off. It can also protect the pump motor from electrical surges or other electrical problems. 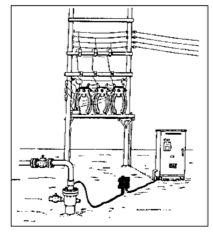 Transformers: These transform the power received from the electrical grid to the correct specifications for the pump. These are usually placed at the edge of the lease site. Electrical Supply: The power grid that supplies your transformers. The highest voltage you can get usually produces the best result. Tubing Head: This component supports the tube and also provides a seal for the electrical cord to pass into the tubing. The seal is commonly designed for at least 3,000 psi. Chart Meter: A chart meter isn’t required for operation, but it can be worthwhile. It measures the well’s production, providing information that can help identify problems. Figure 2: Surface components necessary for an Electrical pump. Cable: The cable leads from the surface, down the outside of every joint of tubing. It is strapped to the side of the pump, and leads directly to the motor. It consists of a flat three strand wire where it enters the motor, but is a round cable for most of its length. It may have a metal shield to protect it. Motor: At the bottom of the pump, it is lowered into the well first. Use the correctly sized motor for your estimated production. Protector: This is attached to the top of the pump, and seals the motor to allow a drive shaft to drive the pump. Pump: The pump itself, designed to carry a fluid load. Usually, the shaft is made of an alloy called Monel, with the stages being made of a corrosion and wear resistant material. Most pumps of this type have a rotary centrifugal action. Is your appetite for oil & gas operating knowledge insatiable like ours? 😀 If so, check out this related article, Submersible Electrical Pumps for Oil & Gas Pumping: Automatic Controls – it will surely pump you up!! !